New Jails to End All Jails? Do we have enough energy and willingness in this moment to be bold? There is a remarkable debate underway right now in New York City about closing the notorious Rikers Island jail complex. It’s a debate about the future and purpose of jails that is also one about land use and public safety, a debate a number of cities in the U.S.—like Austin, Detroit, and Los Angeles—are in the thick of right now. In New York City, in 2017, Mayor Bill de Blasio signed on to closing Rikers Island, a promise made possible in part by the city’s already plunging jail population. That population is currently at about 8,000 people—an historic low—and the city’s target is for a population of 5,000 to allow for Rikers to be replaced in 2027. The city’s plan calls for building four smaller, modern facilities—near city courthouses, not on an isolated island. These would be facilities with improved services, better working conditions for guards, and easier access for defendants’ families. The goal, and it’s one many activists are skeptical of, is to build “better” jails; jails that, as the mayor frames it, will end the era of mass incarceration in New York City. The city’s plan has also been met with opposition from the neighborhoods where the facilities would be located. Residents have objected to the size of the planned buildings—the city wants more services in the facilities, and more services require more space—and about a process they feel has not been open enough to input from the community. On the panel were Elizabeth Glazer, director of the Mayor’s Office of Criminal Justice; Pamela Drayton, a former corrections officer on Rikers Island; and then two advocates who have both experienced incarceration at Rikers: Stanley Richards, executive vice president at the Fortune Society; and Johnny Perez, director of the U.S. Prison Program for the National Religious Campaign Against Torture. Stanley RICHARDS: Do we have enough energy and willingness in this moment to be bold? Matt WATKINS: Welcome to New Thinking from the Center for Court Innovation. I’m Matt Watkins. That voice you just heard was Stanley Richards with the Fortune Society. He works with the formerly incarcerated and is formerly incarcerated himself. And that moment he's referring to is the remarkable debate underway right now about closing New York City's notorious Rikers Island jail complex. It’s a debate about the future and purpose of jails that a number of cities in the US are in the thick of right now. In New York City, in 2017, Mayor Bill de Blasio signed on to closing Rikers Island. That was a decision made possible in part by the city’s already plunging jail population. It’s currently at about 8,000—an historic low—and the city’s target is for a population of 5,000 to allow for Rikers to be replaced in 2027. The plan calls for building four smaller, modern facilities, near city courthouses, not on an isolated island. These would be facilities with improved services, better working conditions for guards, and easier access for defendants’ families. The goal—and it’s one many activists are skeptical of—is to build “better” jails, jails that, as the mayor frames it, will end the era of mass incarceration in New York. 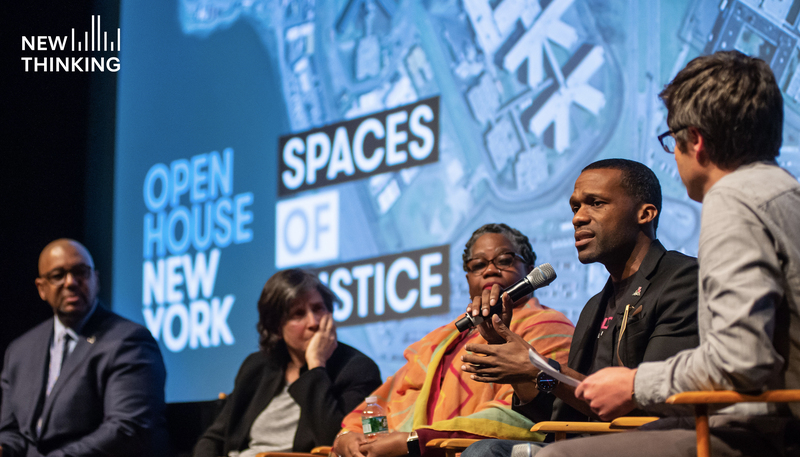 In New York City, I had honor of moderating a recent public event on that debate called “Justice by Design.” It was hosted by Open House New York and you’re going to hear highlights from it on today’s episode. On the panel discussing the future of jails in NYC were Elizabeth Glazer, director of the Mayor’s Office of Criminal Justice; Pamela Drayton, a former corrections officer on Rikers Island; Stanley Richards from the Fortune Society; and Johnny Perez, formerly incarcerated on Rikers and elsewhere and now director of the U.S. Prison Program for the National Religious Campaign Against Torture. You’ll also hear references, one right off the top, to a slide Liz used in her presentation. It’s a series of maps of the city showing neighborhoods with the highest incarceration rates and how those same neighborhoods are also suffering the most disparate outcomes in areas like employment and infant mortality. You can see the map for yourself on our website. Go to courtinnovation.org/newthinking. 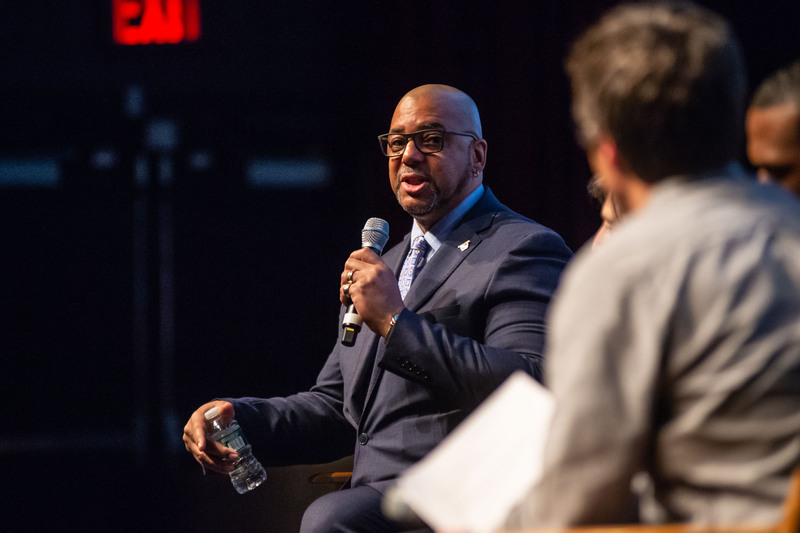 So, I started off the night’s discussion with a big picture question: does closing Rikers really present the opportunity to end the era of mass incarceration in NYC. Stanley Richards speaks first, and then you’ll hear me introduce each panelist in turn. RICHARDS: I think closing Rikers does more than that. I think those things will happen, but I reflect on Liz's slide around the underlying issues that drive mass incarceration, when you look at unemployment, mortality, you look at education, you overlay those maps. What we're talking about by talking about closing Rikers is putting ourselves in a position to reinvest in those communities, reinvest so that we don't have so many people cycling in and out of jails, reinvest in the community so people can have jobs and people could have decent access to education. So for me, closing Rikers, all of those things will happen—it's a process. But for me, it's about how do you really invest in the communities and reduce the drivers of mass incarceration? WATKINS: All right. Thank you. Liz? Elizabeth GLAZER: I think "closing Rikers" is actually the wrong term. It's not about real estate, and it's not about mechanics. All of those things are a means to creating a more just system. And so when we talk about getting the population down, it sounds very mathematical, but it's not mathematical at all, because what it really is talking about is: how is it that you figure out that the best way of addressing people who may have multiple issues—homelessness, mental illness, other things—that the first response is not the criminal justice system. Pamela DRAYTON: Closing Rikers isn't about a building; it is about the people. On Rikers, people are not treated like people; they're treated less than human. The environment, it actually holds the truth that "You are not human." We do need to inspire and encourage the people who are there, so that when they do go back into the communities, they have something that they've taken away that they can bring back. And you can't get that at Rikers. It's antiquated. The building is antiquated. The laws that hold them there are antiquated. And all those things need to be fixed. WATKINS: Johnny, what do you think? Johnny PEREZ: For me, I think about it really symbolically. Getting to a place in the city where the criminal justice system is more reflective of what we say our shared values are. So on one hand, we say that we believe in justice, that we believe in fairness, that we believe in issues of safety, but the current system in its current form doesn't reflect that. So when I think about closing Rikers, I think about the reflection of our shared values, but also closing down a place where so much atrocity has happened, and has had probably perpetual impacts on people's lives. So I think about the lives that have been harmed by the place, and also getting us to a place that's more reflective of our shared values. WATKINS: All right. So it's obviously about more than just closing a building; it's about, I think, closing out on a philosophy and an approach—a kind of mass approach, if you will. And we're talking about treating people as individuals, and I really think a good focus for the conversation, I think it came out in the movie and maybe Liz's presentation as well, is dignity, is treating people with dignity. But the question is how do we embody that in the design? Stanley, for example, you're on this design committee. So how do we embody this focus on treating people as individuals through the design of these new facilities? RICHARDS: You bring to life the design principles that we came up with. Those principles have to be woven into the actual design of the facility. We have to build it in such a way that the men and women who work there—the officers, the volunteers, the civilian staff, the people who have to be detained there— everybody feels like, "That place is a place that treats me like I matter. I'm being held accountable for whatever reason, but the place and the way that it operates recognizes the human dignity in everybody." So as we were going through the design principles, we weren't just looking at it like, "Okay, what do we have now? And how do we build a better building?" It was like, "How do we have the building be a place that speaks to people? That provides opportunities for officers and detainees to talk?" And so we think we could do that through design. That's one element, through design. WATKINS: Pamela, you had a son who was detained on Rikers. You also worked as a corrections officer on Rikers Island and had that direct experience. So how do you think we can do dignity in a carceral setting? DRAYTON: I think it depends on the training that the officers get. The training needs to be more community policing kind of a training where we have interactions with one another, that there are people talking to people, not people dictating to people what they need to do and speaking to people as though they're children. WATKINS: And Rikers probably hasn't changed that much since 1982, right? DRAYTON: No, it hasn't. From the last time I visited my son there, which was around 2013, it was the same. It was the same—getting across the bridge, it was horrifying as usual. Getting to the control building. Then after you get to the control building, you have to find the bus that takes you over to the facility that you're going to, because there's no walking on Rikers. Once you get to the visit area, it could take hours to get in there. They'll tell you ... They won't tell you. They won't inform you of the process. It's almost like the subway system, right? You get stuck on the train in the tunnel and no one says anything, so you don't know what's going on. And it's the same thing on a visit. When you get to the visit, you will sit and wait and no one will tell you anything. No one will say, "There's a count. We can't release the population yet." Nobody gives you that information. That's disrespectful. It's like we need to respect one another, and as a visitor, they make you feel like you're the criminal. They show you no respect. It's really hard being on this side. But being a correction officer, and when I worked the visits I seen a lot of things, like people trying to bring in contraband and stuff like that, but I didn't think the officers needed to be as hard on people as they were. And maybe that's just me, it's just who I am. But I think if you speak to people and you speak to them with respect, you will get a better response. WATKINS: And Johnny, you're someone who's experienced incarceration and reentry, and pretty clearly you've made quite a considerable success of reentry. But what difference do you think this focus on treating people as individuals, if we can really get to that point, and having people in communities where things are more accessible and services are more accessible to them, what difference do you think that will make for people's reentry? PEREZ: Just really quick, just to mention about the design: people need to understand that if you've never been inside of a cell, it's the most dehumanizing space you can be in. I'm talking about imagine a place where you… I don't know. No mirrors, for example. We take mirrors for granted. Everybody looked in the mirror this morning. There are people that are locked in cells that haven't looked at themselves in mirrors for years at a time. So we talk about dignity, it can be something as simple as that. I'm not saying the mirrors are going to make the change, but just to expand the magnitude of the issue. As far as it relates to having more access to families, me and my daughter are in the film. We were separated for a long time. So how hard does the reentry look like? And here it is, we live in a city where most of the people that are currently incarcerated in our city’s jails are going to come out one day. So it makes sense to strengthen those family ties, to facilitate communications between individual and the community, to increase the likelihood that they'll be able to not only become employed, but also have access to their families, have access to mental health treatment, have access to a number of different things that they need. So I think it affects folks in a number of different ways, more than we probably can fathom right now. WATKINS: And then Liz, I wanted to talk a little bit about the case of women being incarcerated on Rikers and elsewhere. We know that the vast majority of women are incarcerated for nonviolent offenses. We also know they tend to have very specific needs. I mean, most people, male or female, in jail or prisons have experienced often some pretty serious trauma and victimization. But that's an almost universal experience for women in incarceration. So going forward, if we get to this new model, what kind of specialized services are there going to be for women? And have we given thought to having a special, unique facility for them, which might help with some of the concerns over the size of some of the current proposed sites? GLAZER: So we can't wait for five or 10 years to solve this issue. And it's an issue, obviously, of deep concern to everybody. I think with women, there's been a very large investment in programming, in visiting, in mental health services. Women often have a higher rate of mental health needs than actually the men at Rikers. There's been quite a bit of investment in ensuring that visiting is not what you've experienced, that the women can come out and meet their children and families in places that are not the jail. But all of these are just pieces. And I think as we try to weave this together now, it's also an opportunity to think through whether there is a single facility for women centralized in one place or whether they're in different places. WATKINS: And then you mentioned mental health, which again is a problem… this is not just women, this is the whole population. And I think all of you here have dealt in different ways with this issue of mental health and incarceration, so I guess an open question for how we’re hoping to see the issue of mental health dealt with going forward. Again, whether there's some kind of maybe a dedicated facility that removes it from the control of corrections, for example. GLAZER: So again, this is an issue that's here and now, as well as one for planning. And I think it has many different parts to it. One is, who actually is entering the facility? Because someone called 911? They may have been acting up. And a police officer's options are really jail or nothing. That's really a terrible thing. And so the first instance is, how do we ensure that people aren't getting arrested because that's sort of the automatic pilot after 911? The second thing is, how do we have better services for people on the island? There's been a big investment in that and a whole series of different kinds of special units for people who suffer from mental illness and other behavioral health issues. And I think the third thing, which is sort of in the works now, is, if in fact people have mental health issues and have to be confined, is there another way—not jail—that they could be treated and still meet their court obligations? RICHARDS: And that's what this moment presents right now, the moment about size of jail, population-specific. And I think by all of us coming together and really fleshing out what Liz just talked about, about people with mental illness, about women… Do we have enough energy and willingness in this moment to be bold? And to reverse some of the harms that mass incarceration did for people with mental illness? By closing down mental hospitals and community services, we ended up with all of these folks in jails and prison. Can we use this moment to reverse that? WATKINS: And Johnny, I know you've done a fair bit of work on this issue, and I wonder what you would like to see. I mean, as Liz keeps helpfully reminding me, this is not just a 10-years-down-the-road issue, any of these questions, it's very much here and now too. So, what you would like to see in the short-term for better dealing with this issue of mental health, and then what your hopes are for this more long-term process. PEREZ: They're both kind of similar. I think that people with mental health challenges don't deserve to be incarcerated. I think that carceral is not equipped to deal with folks who have mental health concerns. And I think that the city can do better, with due respect. Crisis response teams: there are folks, advocates, who are doing that work, who intervene in instances where people are having whatever challenge they're facing, and diverted from incarceration, diverted from a jail cell. I've seen that professionally. And then being inside of the cell, I've spoken to folks that you can clearly see that this person needs some type of professional, medical attention versus locked in a cell all day or whatever have you. So I think that we should be diverting people. I think that we already are, but I think we can do it to a higher degree and be more aggressive about it. Both in the short term, and eventually in the long-term having a vision where we don't have folks like that who are facing mental health challenges inside of these spaces in the first place. WATKINS: Reduce the footprint of the criminal justice system, in essence. Pamela. DRAYTON: But even on a short-term basis, can we get officers trained in mental health? Can we get them in the jails to be able to identify if this person should be incarcerated, or should they have mental health assistance at the time? WATKINS: I mean, that's some of the idea, again, of this long-term plan, is the building of a new training academy for corrections officers. I'm assuming that the kind of training Pamela is talking about would be part of any curriculum? GLAZER: And ongoing now, and about three or four years ago, a big investment in crisis intervention teams, which would mean both that officers get trained, but also that when there are responses to people who are having issues in the jail, the response is not simply by an officer, however well-trained, but by a mental health professional as well. RICHARDS: And in the Lippman report, I was part of the Lippman commission, we put in there, in addition to the facility, really strengthening the training that they get. How long is the training when you went through the academy? Three months. We had recommended some additional training. Three months to be in that kind of environment, working those kind of hours, we need to do something with the training. So there were some specific recommendations we hope end up in the Department of Corrections plan. WATKINS: I mean, are we confident though that we can turn around this culture of punishment, really? I mean, that's what we're talking about when we're talking about Rikers Island. Are we confident that more training for DOC officers, that that is going to turn things around? RICHARDS: I don't think it's one of those things. I think we need to do all of it. At Fortune, we say "hurt people hurt people." And if we start treating officers like they matter, if we give them decent training, we give them a decent Academy, we create a vision for them about what care-custody-control really is, and how care-custody-control plays out in the new vision of the new jails, we could begin to chip away at all of the old stuff and really bring in a new energy around confinement, and conditions of confinement, and how people work together. So I don't think it's one thing; I think it's a combination. WATKINS: So I want to turn to talk about something Liz mentioned, which is this question of violence, and offenses involving violence, or offenses that the criminal justice system labels as involving violence, which often isn't what you or I would think is particularly violent. But so often criminal justice reforms end at the water's edge of violence. And it's pretty clear if we're going to keep dropping the population down, we are going to need to take a new approach to offenses involving violence and the people who have been convicted of committing them. So, again, it's an open question I guess for what people think that new approach could look like. PEREZ: I think it already looks like restorative justice. I think there's groups that are already doing restorative justice programs. And I think nationally, the conversation around how we respond to violence has been elevated because, in a lot of different states, they're at a place where they realize that even if you let out every single person who's been arrested for a low-level drug offense, we'll still have the largest incarcerated population in the world. So I think that definitely restorative justice. And the piece about culture is that it's more than just training. I had colleagues who recently visited Germany, I believe, and one of the ways in which they reduce violence in Germany is just by strengthening the relationships between the person who's doing the time and whoever works there. So that's something to completely think about and challenge. In fact, I would even argue that we need to just completely limit DOC's role because they've already shown that they're not even competent to run the facility in the first place, and highlight the folks who really have the training and resources, and resource these folks to do that work, whether it's mental health practitioners, social workers. When I think about my incarceration, I didn't listen to one correction officer. Not one. Just because of the uniform they had on, you’re automatically disqualified. Some of my best conversations came from mental health service providers, counselors, so on and so forth. So these facilities give us the opportunity to reimagine not only design, but also reimagine roles within those facilities. WATKINS: And Liz, Stanley says now's the moment to be bold. Do you think that the city is prepared to take some bold steps on this question of offenses regarding violence? GLAZER: So I agree that we paint with a very broad brush, and we take the label instead of what the actual risk is that someone may pose or not pose. So I think there's a lot of work to be done there, but I think that it's going to require culture change. It's going to require culture change by New Yorkers who are willing to have people who have committed a serious offense, wait for trial in the community. It's going to require culture change by judges who are willing to let people out. And I think we are already seeing that a little bit. One of the biggest drivers of that is a program in the city called Supervised Release that gives judges an option between jail and nothing, meaning you release somebody with no conditions at all, or you put them in jail essentially because they're on bail. This is a program that judges used, to enormous effect. It's driven a big part of our jail population down. And because over the last three years judges have seen that it works, over the last six to eight months, new programs have now grown up for younger folks—18- to 24-year-olds—who have been charged with violent offenses who are now eligible for that program, meaning that they can be released. And it's had very, very good success. But I think it's going to require that culture change for people to see through the label of the offense to who the person is in order to reduce that population. WATKINS: Obviously this is a big and difficult conversation and it's proposing some pretty seismic changes, not just to the criminal justice system in the city. And there's been a lot of opposition. And there's a lot of opposition in the communities, and the neighborhoods where these proposed jails, facilities would go. And it's not just an issue of not-in-my-backyardism at all. There are people with very real concerns about the size of these proposed facilities. And people clearly feel that they are not being heard. GLAZER: So there's been a lot of engagement so far, pretty intensive, and there's a lot of process to go through still, which will be very, very intensive, with community boards, elected officials, neighborhoods, etc. 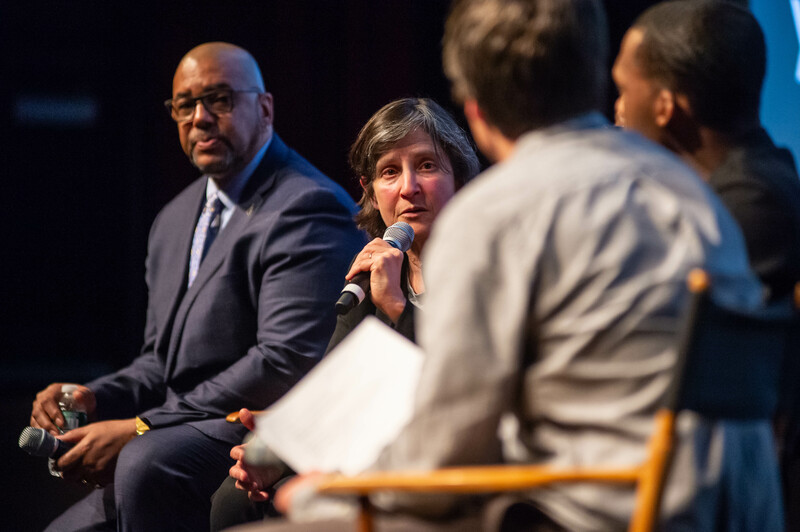 And I think that's very important to have that kind of engagement, and that's going to be a crucial part of shaping what the jails look like, and how they fit into the neighborhood. And it's important to the city that they be a part of the neighborhood and not dominate. WATKINS: Is there a thought then to making the towers smaller? I mean, hopefully without reducing services. GLAZER: So I think every focus is on reducing the population, and that is the name of the game for reducing the size of the buildings. And I think also, as Stanley mentioned earlier, there is going to be a give-and-take of "What are we willing to give up inside, with respect to program areas, or housing areas, or direct sunlight, or indirect sunlight?" So there are a whole array of things that can be done and we are committed to doing that. WATKINS: And I guess a question for Stanley and Johnny: there's also been opposition from a different direction, which we could call the no-new-jails voice in this debate. And you guys are both formerly incarcerated people who are really dedicated to improving criminal justice in the city. Is it difficult for you to find yourself on a side of the debate where you are in a sense, I don't want to say on the other side, but having to navigate this other opposition, which is saying, "No, we don't want 21st century jails. We want 21st century communities." RICHARDS: And I'd say they were right. In an ideal world, can we exist without jails? It would be great. But we have a reality that we are dealing with. And the reality is that we had a system that had 22,000 people detained. We had over 150,000 people cycling through. And we have to do something about it. And we have a national problem with how many people we have incarcerated. And I think the first step is to reduce our reliance on incarceration. The second thing I think we have to do, and this goes to the community question, is we have to stop demonizing each other in this conversation, and really just start listening to each other and start working together, where we see the best in each other, and we listen to each other to get this thing to move forward. WATKINS: Johnny, how do you understand where people can get, I mean, the best out of the sides of people with good faith here working towards improving things? PEREZ: I struggled with the question for a while. Being formally incarcerated, but also being a black man in America, and raising a young black boy, and raising a young girl who is also of color and knowing that chances are they will see the inside of a cell in their lifetime, at least higher than everyone else. What really made it for me—and as an abolitionist, I believe that we can truly get to a place where we don't have prisons because I've seen it… But the understanding that it's an overall reduction in the entire system, in the criminal justice system in New York, but also the city now has a reduced capacity; the new-jails folks: “If you create it, they'll fill them.” And that's very valid, except that you can't fill beds that are not there. So when we look at where the capacity is now to where it will be at the end of the plan, there's only but so many people that you can put in there. And then guess what? We'll come back for the rest of those beds, to eliminate those too. But for now, do we see overnight a New York City that doesn't have it? I just think that this is a necessary step toward abolition. I just don't think that we are in a place where we can actually see that so fast and rapidly. WATKINS: I mean, on the topic of being too far away to see that goal just yet, in a sense, we've already given a kind of outline of the answer to question, but I feel I'd be remiss if I didn't ask this question, which is, yes, as Liz laid out in her presentation, there's a kind of New York City miracle that's been quietly underway for a while in terms of incarceration numbers and crime numbers. And it's really something and it holds a lesson for the country, I think. But at the same time, as we saw in that really affecting graphic that Liz put up, racial disparities have not moved in all of that time. Even as the base rates shrink, the racial disparities remain the same, if not, in some instances, even hardening. That just vastly deprives from this feel-good story I just proposed of the New York City miracle. So, what are we going to do about that? GLAZER: Yeah, and this is why I don't think this is just a criminal justice system. It's not getting under the sink with a wrench and making the system a little better, or more efficient, or fairer. I think it's a much, much more fundamental issue that has to do with investment in jobs, and education, and decent public places in a very focused and intensive way. RICHARDS: One of the elements, I know for me, that helped me change my life was education. When I thought all my life I was going to be cycling in and out of prison because I thought that was my destiny, that was my life. And then when I realized, through education, that all those messages I got about my worth, and all those messages I got about who I was because I come from the projects, were lies. And I discovered who I was through education. So Liz is right; this is more than just mass incarceration. This is about investments in communities and education. And the things that we know… The map, the red map—if you overlay them and did it like that, you can see it. So we know where the problems are. We have to do the investments. 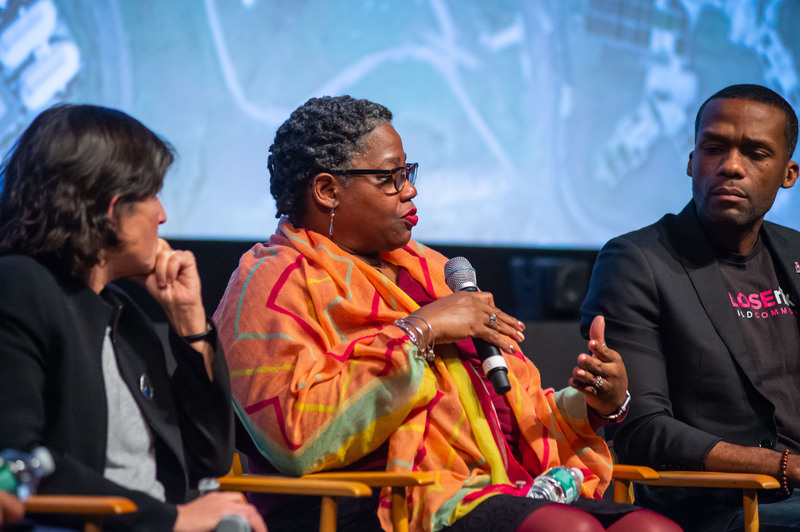 WATKINS: Those were highlights from an event in New York City I recently moderated called ‘Justice by Design,’ and it was hosted by Open House New York. On the panel you heard Elizabeth Glazer, director of the Mayor’s Office of Criminal Justice; Pamela Drayton, a former corrections officer on Rikers Island; Stanley Richards executive vice president at the Fortune Society; and Johnny Perez, director of the U.S. Prison Program for the National Religious Campaign Against Torture. I have a number of people to thank for today’s episode: Gregory Wessner and Bill Hunter at Open House New York; Colby Kelly and Bryant Silva from Public Square Media, and if you’re in the New York City area April 23rd, NYU is hosting a screening and discussion of Public Square’s ‘After Rikers’ film, and there’s more info and a link to register for that on the page for this episode on our website, go to courtinnovation.org/newthinking. Thanks as well to Urban Omnibus for letting me rework the title of a piece they published to use for this episode. Please go read their piece on Rikers: ‘A Jail to End All Jails,’ also on our episode page. Thanks as well to the technical staff at the SVA theater, Greg Berman, and Maurice Chammah. This show is edited and produced by me, please find me on Twitter @didacticmatt. Technical support is from the garrulous Bill Harkins. Our director of design is Samiha Meah. Our VP of outreach is Emma Dayton. Our music is by Michael Aharon at quivernyc.com, and our show's founder is Rob Wolf. This has been New Thinking from the Center for Court Innovation. I’m Matt Watkins. Thanks for listening.